Cranky says, "There are lots of ways to bind a book, but they all fit into three general categories. Library binding is my favorite . . . "
PLEASE NOTE! Cranky is now retired and no longer rebinding books. If you have a book needing rebinding, please check the recommendation message on the Home page! Mechanically bound books are characterized by the pages being held together by a device of some sort. Sometimes this is as simple as a couple of screw posts tightened through punched holes. On the other end, custom designed looseleaf binders contain document pockets, indexes, and can be flipped and folded into a self-standing easel for group presentations. Some forms of mechanical binding have become standards for particular applications. For instance, wire binding, either of the coil or crimped type, has become the most common method of binding flip-over page calendars. Plastic binding is used extensively by cook book manufacturers because the books lie flat on a kitchen counter while in use and the wide area of plastic on the spine can be imprinted with the book's title and other decorations. 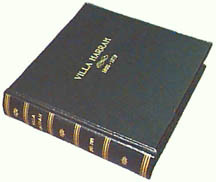 Velo binding is an inexpensive "do it yourself" binding method sold to small offices and libraries. There are several variations on this method of interlocking plastic strips through small punched holes where function is more important than appearance or speed of production. Thick soft cover books are usually Perfect Bound. 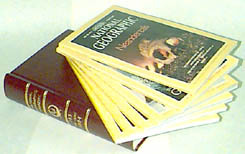 This type of binding is typical on catalogs, telephone books, and paperback novels. Sheets or signatures are collated on top of each other. Then the backbone folds are removed by a rough saw, coated with glue, and a cover is formed around the "square" backbone. Perfect binding (also known as adhesive binding in some regions) can accommodate books from about one-eighth inch to several inches thick. When Perfect binding was first introduced, the book blocks were also wire stitched from front to back. As books became thicker than a wire stitch could penetrate, and glues became more reliable, stitching was left out of the process. Saddle stitching and Perfect binding are inexpensive binding methods. Both were designed for books not expected to last long periods of time. Even though some paperback novels remain usable many years after they were purchased, soft cover binding is still more appropriate for catalogs and telephone books, which are seldom expected to last more than a year or so. In the past decade, there has been a growing trend to use Perfect binding to fasten a book block into a hard cover. The only reason for doing this is to save the cost of sewing and proper casing-in. Books bound in this manner may look like a genuine library bound book, but they have an unfortunately shorter useful life. Many purchasers fooled by this type of binding are very disappointed when their books start coming apart after a relatively short period of time. Perfect bound books with hard covers should be considered to be in the pamphlet binding category, since there is nothing except glue holding this kind of book together. Cranky says, "About the only time I get involved in mechanical or pamphlet binding is when someone wants one of those to last a long time. Then I hard bind it for them." Library bound books have been constructed in about the same way for over 500 years. Sheets or signatures are collated into a stack, then sewn together with needle and strong thread. "Section sewing" and "Smythe sewing" runs thread through the backbone of each signature in a manner similar to saddle stitching, then the sewn signatures are attached together to form a strong backbone. Single sheets and thin signatures are "side sewn" about 1/8 inch from the binding edge. Either method produces a sturdy and flexible binding. Folded end sheets and headbands are attached to the book block. Kraft or super is glued across the backbone to prevent the sewing from stretching or coming loose and to form strong hinges where the end sheets and covers will open and close. If necessary, the book is trimmed on three sides to clean off signature folds, then the backbone is shaped into a slight curve (rounded) and tucked to make a ridge along the spine (backed) that will fit it snugly into the wrap-around cover (case). 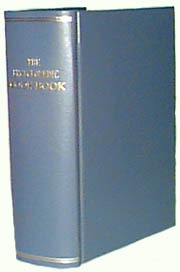 Front and back covers are made of a thick cardboard core (board) and spaced apart an appropriate distance to accommodate the thickness of the book. Fabric or leather cover material is glued to the boards and a thinner piece of board that reinforces the spine. The cover material is wrapped around the edges of all three boards and securely glued. The spine and/or front cover is stamped with the book title and author. This assembly is now a "case." The outside end sheets of the book block are coated with glue and positioned into the case. Freshly made books are squeezed firmly in a "book press" device while the glue dries. Then the finished book is inspected prior to packing for return shipment. Materials used in hard binding have changed over the years. Cover boards were originally made of real wood cut very thin and covered with leather or canvas. Modern cover boards are made of very sturdy cardboard, which is less expensive, easier to cut and handle, and often resists warping better than wood. Outside materials are now often plastic or thin leather mounted to a strong fabric reinforcement backing. Glues holding everything together are now cleaner, more flexible, and remain secure for many years. Even the thread used for sewing has improved. Modern bookbinding thread is stronger, resists moisture and dry rot, and typically lasts much longer. Genuine leather still produces the most attractive and durable books. Modern book leathers are also easier to keep clean than older covers. Many books bound in leather hundreds of years ago that received proper care are still sturdy and serviceable. Since leather was once alive, it retains oils that keep it soft and flexible. Harsh environmental conditions (excessively hot or cold, unusually dry or moist, etc.) affect these oils and will make leather stiff and brittle. But when treated right, leather will last like . . . well, like leather! Imitation leathers and buckrams are also of much better quality and durability than they were in years past. The plastic basis retains its flexibility longer and the finish is tougher and easier to clean. Man-made cover materials will give many years of service with very little maintenance. Modern imitation leather products are also very attractive, and many are textured to appear similar to real leather. Imitation leathers and buckrams are especially suited to situations where economy is very important, or for books that may need frequent cleaning, such as books for children and cookbooks. Cranky says, "Genuine leather is a little more expensive than the imitation products, but a better value when durability and a long, useful life are important."